새 파일이 생성될 때 모니터링합니다.Monitor when new files are created. 그룹을 만들고 방해 금지를 설정합니다.Create groups and set do not disturb. 트리거를 사용하여 Slack 계정에서 응답을 가져오고 다른 작업에서 출력을 사용하도록 할 수 있습니다.You can use triggers that get responses from your Slack account and make the output available to other actions. Slack 계정을 사용하여 작업을 수행하는 작업을 사용할 수 있습니다.You can use actions that perform tasks with your Slack account. 또한 다른 작업에서 Slack 작업의 출력을 사용하도록 할 수 있습니다.You can also have other actions use the output from Slack actions. 예를 들어 새 파일이 생성되면 Office 365 Outlook 커넥터를 사용하여 이메일을 보낼 수 있습니다.For example, when a new file is created, you can send email with the Office 365 Outlook connector. 논리 앱을 처음 접하는 경우 Azure Logic Apps란?을 검토합니다.If you're new to logic apps, review What is Azure Logic Apps? Azure 구독.An Azure subscription. Azure 구독이 없는 경우 체험 Azure 계정에 등록합니다.If you don't have an Azure subscription, sign up for a free Azure account. 자격 증명을 통해 Slack 계정에 대한 연결을 만들고 액세스하는 권한이 논리 앱에 부여됩니다.Your credentials authorize your logic app to create a connection and access your Slack account. Slack 계정에 액세스하려는 논리 앱입니다.The logic app where you want to access your Slack account. Slack 트리거를 시작하려면 빈 논리 앱을 만듭니다.To start with a Slack trigger, create a blank logic app. Slack 작업을 사용하려면 트리거(예: Slack 트리거 또는 되풀이 트리거와 같은 다른 트리거)를 통해 논리 앱을 시작합니다.To use a Slack action, start your logic app with a trigger, such as a Slack trigger or another trigger, such as the Recurrence trigger. 논리 앱에서 서비스에 액세스하려면 논리 앱과 해당 서비스 사이에 연결을 만들어야 합니다.Before your logic app can access any service, you must create a connection between your logic app and that service. 이전에 이 연결을 만들지 않은 경우 논리 앱에 해당 서비스에 대한 트리거 또는 작업을 추가할 때 연결 정보에 대한 메시지가 나타납니다.If you didn't previously create this connection, you're prompted for connection information when you add a trigger or action for that service to your logic app. Logic Apps 디자이너는 논리 앱에서 직접 이 연결을 쉽게 만드는 방법을 제공합니다.The Logic Apps Designer provides an easy way for you to create this connection directly from your logic app. 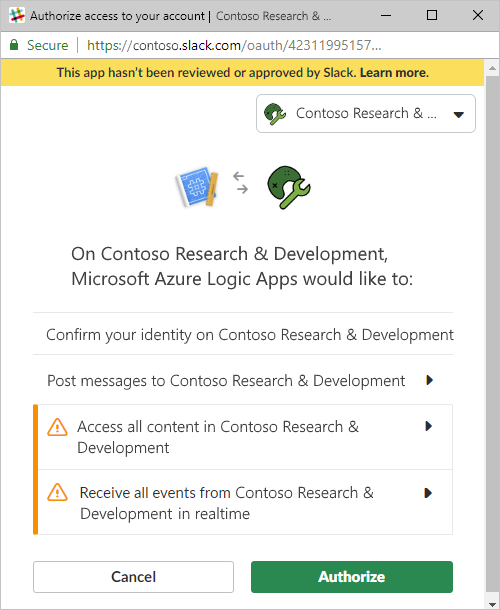 Azure Portal에 로그인하고 아직 열리지 않은 경우 Logic App Designer에서 논리 앱을 엽니다.Sign in to the Azure portal, and open your logic app in Logic App Designer, if not open already. 빈 논리 앱의 경우 검색 상자에서 필터로 “slack”을 입력합니다.For blank logic apps, in the search box, enter "slack" as your filter. 트리거 목록에서 원하는 트리거를 선택합니다.Under the triggers list, select the trigger you want. 기존 논리 앱의 경우 작업을 추가하려는 마지막 단계에서 새 단계를 선택합니다.For existing logic apps, under the last step where you want to add an action, choose New step. 검색 상자에서 필터로 “slack”을 입력합니다.In the search box, enter "slack" as your filter. 작업 목록에서 원하는 작업을 선택합니다.Under the actions list, select the action you want. 단계 사이에서 작업을 추가하려면 단계 사이에 있는 화살표 위로 포인터를 이동합니다.To add an action between steps, move your pointer over the arrow between steps. 표시되는 더하기 기호(+)를 선택한 다음, 작업 추가를 선택합니다.Choose the plus sign (+) that appears, and then select Add an action. 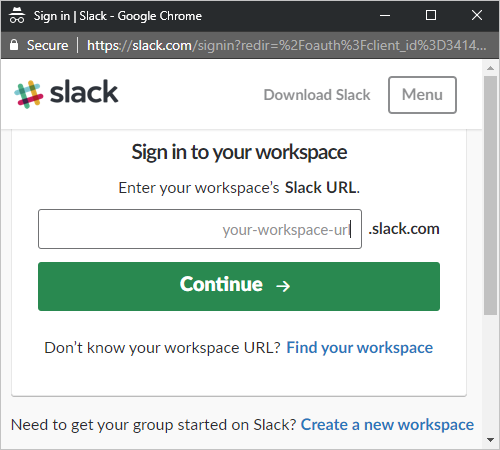 Slack에 로그인하라는 메시지가 표시되면 Slack 작업 영역에 로그인합니다.If you're prompted to sign in to Slack, sign in to your Slack workspace. 논리 앱에 대한 액세스 권한을 부여합니다.Authorize access for your logic app. 선택한 트리거 또는 작업에 필요한 세부 정보를 입력합니다.Provide the necessary details for your selected trigger or action. 논리 앱의 워크플로를 계속 빌드하려면 더 많은 작업을 추가합니다.To continue building your logic app's workflow, add more actions. 커넥터의 OpenAPI(이전의 Swagger) 설명서에 설명된 트리거, 작업 및 제한에 대한 기술 정보는 커넥터의 참조 페이지를 검토하세요.For technical details about triggers, actions, and limits, which are described by the connector's OpenAPI (formerly Swagger) description, review the connector's reference page. 질문이 있는 경우 Azure Logic Apps 포럼을 방문해 보세요.For questions, visit the Azure Logic Apps forum. 기능 아이디어를 제출하거나 투표하려면 Logic Apps 사용자 의견 사이트를 방문하세요.To submit or vote on feature ideas, visit the Logic Apps user feedback site.